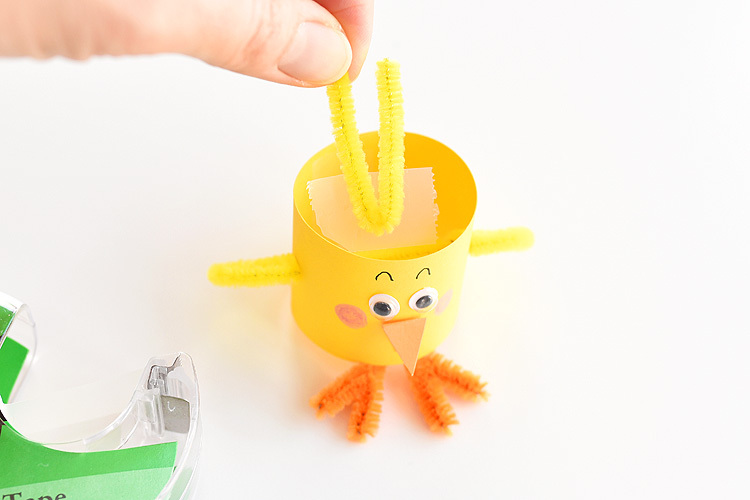 These paper roll chicks are so simple to make and they’re such a fun weekend project to make with the kids! 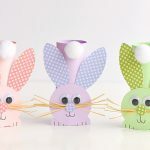 Or wouldn’t they make adorable little egg holders for the Easter table too? 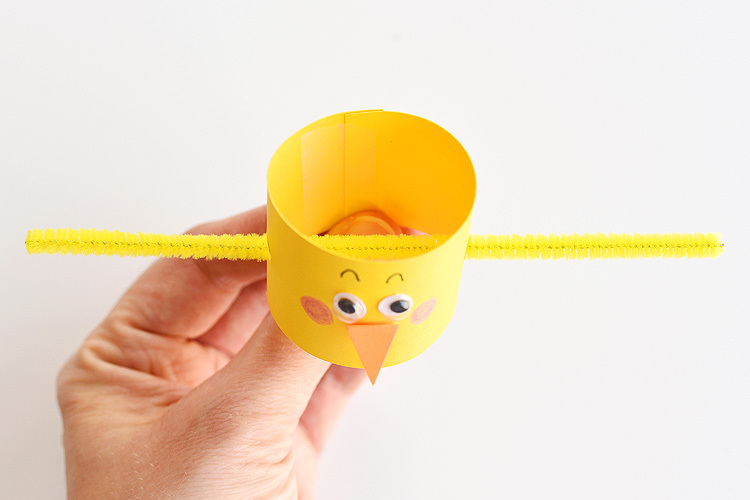 The pipe cleaner wings go all the way through the paper roll, so eggs can sit up beautifully in them! 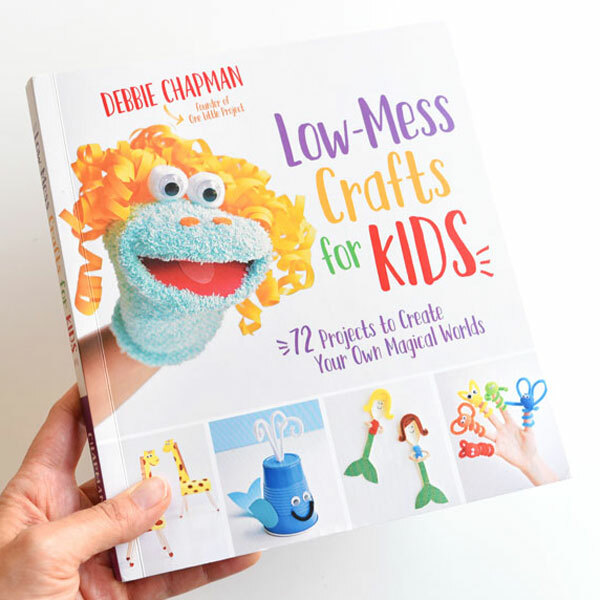 They only take about 5 minutes to make and they are definitely simple enough for kids to make by themselves. Easter is early this year, so we’re already planning our annual Easter egg hunt. Do your kids love Easter egg hunts as much as mine do? Every year we have a big Easter egg hunt at my parents’ house with almost two hundred of those dollar store plastic eggs. We were visiting my parents this past weekend and my dad was complaining that he was spotting plastic eggs all through the summer while he was mowing the lawn last year. lol My parents have a huge property out in the country, so there’s tons of places to hide the eggs and apparently, we hide them too well! My kids are really into it though. There’s 7 young kids/cousins on my side of the family – 3 of the kids are mine – and my older two girls are just itching to get the race started (they’re 7 and 5 years old). The grown ups have to hold them back while we finish hiding the eggs, and I can usually see them bouncing up and down in the distance in anticipation. They take it seriously! Once it starts, they run out there like little lightning bolts to collect ALL the eggs. I’m not sure why my neices and nephews don’t race as much?! They stroll along and get a respectable small basket of about 20 eggs each, and they are perfectly happy. My girls on the other hand, end up overflowing a huge grocery bag with dozens and dozens of those plastic eggs each. It’s a competition to them, and they want to WIN. lol It’s lots of fun though and I think they are going to have amazing memories!! 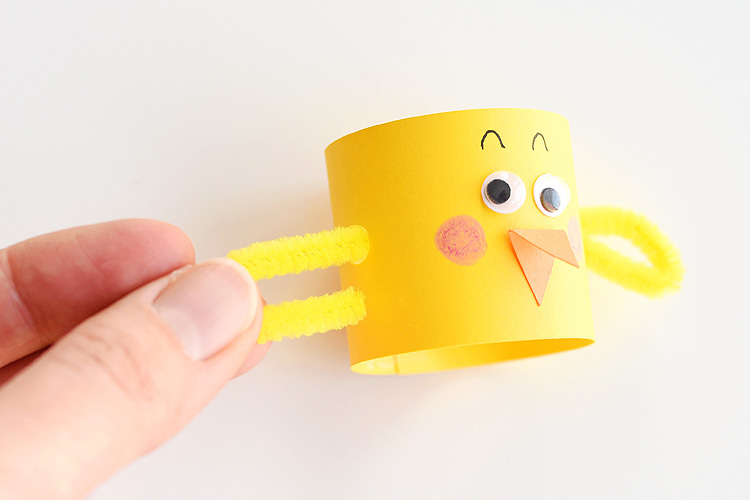 If you want to use a toilet paper roll and paint it yellow, by all means, go for it! I just like that with paper, you don’t have to wait for anything to dry. Plus, it’s way less messy than a little painting project with the kids. 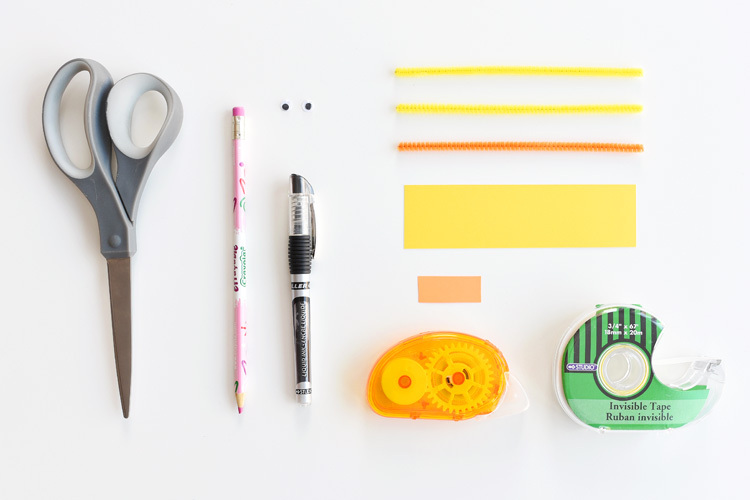 Cut a piece of yellow card stock to be 1.5″ wide by 5.5″ long. 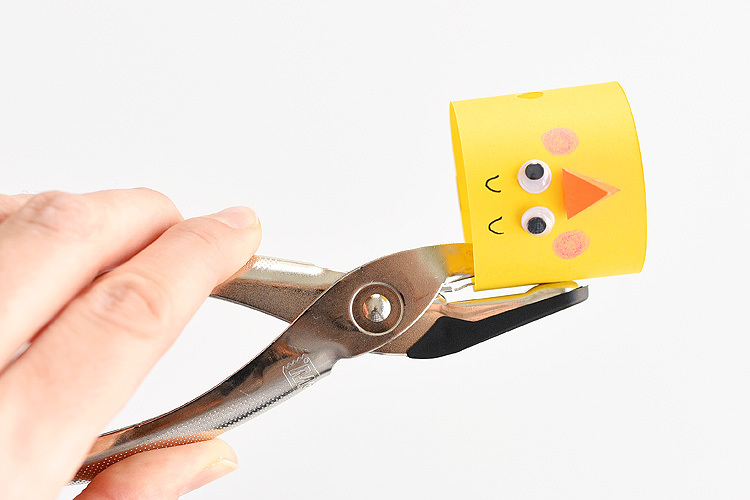 Then use crafter’s tape to attach the googly eyes and the beak to the middle of the paper. 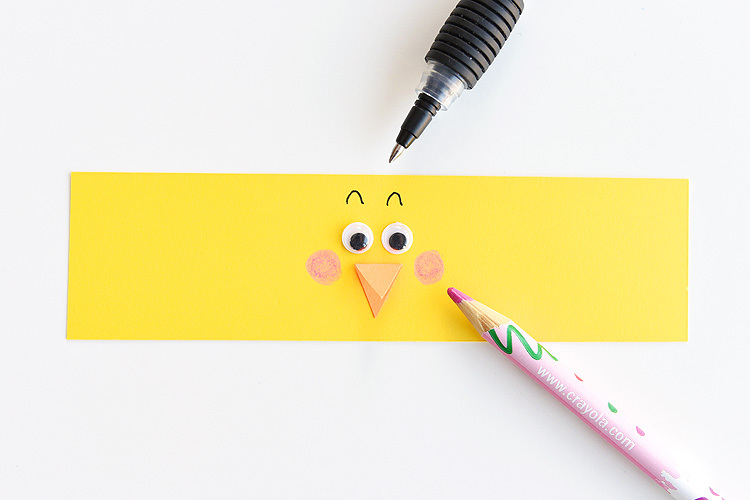 Draw some cute, little rosy cheeks beside the beak with a pink pencil crayon. Then draw some eyebrows above the googly eyes. I’ve tried it many times and it’s waaaaay easier to draw a cute face on a flat piece of paper. So I definitely recommend creating the chick’s face before you roll it up. 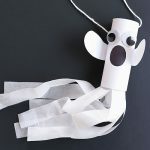 When the face is ready, roll the paper into a tube shape and secure it with a strip of invisible tape. You’ll want to have a strip of tape on the outside as well as on the inside to keep it together. 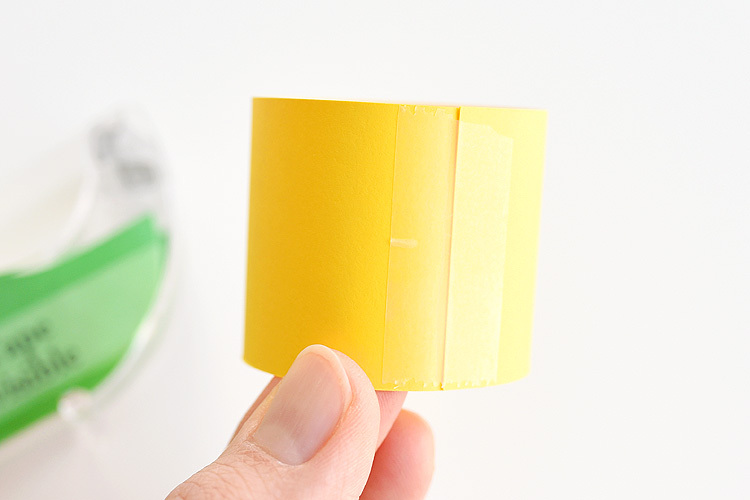 Use a single hole punch to make little holes on the sides of the paper roll. Line them up so they are right across from each other, roughly in the middle of the paper roll. 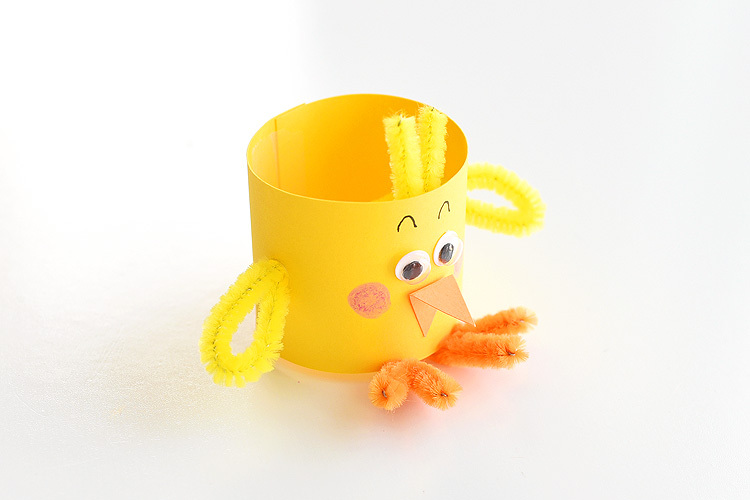 Take a 6″ long yellow pipe cleaner and slide it through the holes in the paper roll. 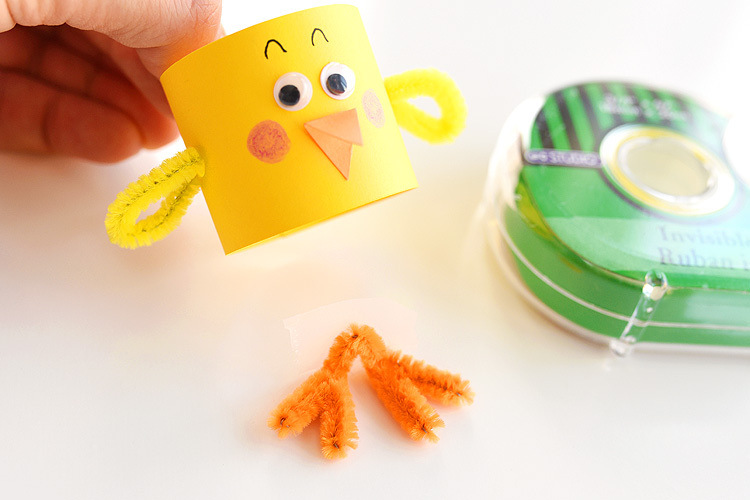 Bend the pipe cleaners into little wing shapes and tuck the end back into the hole. 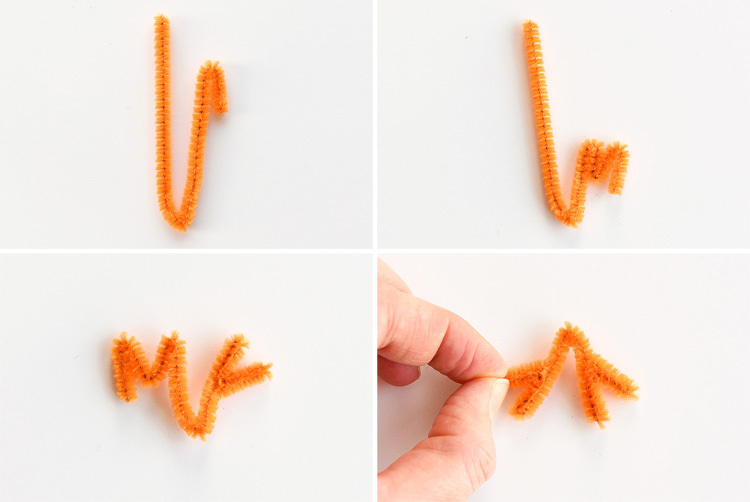 To make the feet, start by folding a 6″ long orange pipe cleaner in half. 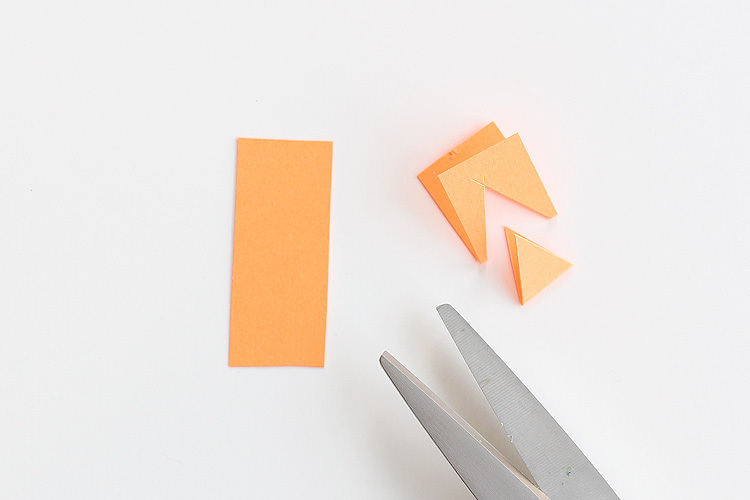 Then fold each side into an “M” shape like in the photo below. Use your fingers to pinch the chick’s feet tightly to make two little “toes” on each foot. I was trying to keep things easy, so I just used tape to attach the feet to the inside of the paper roll. 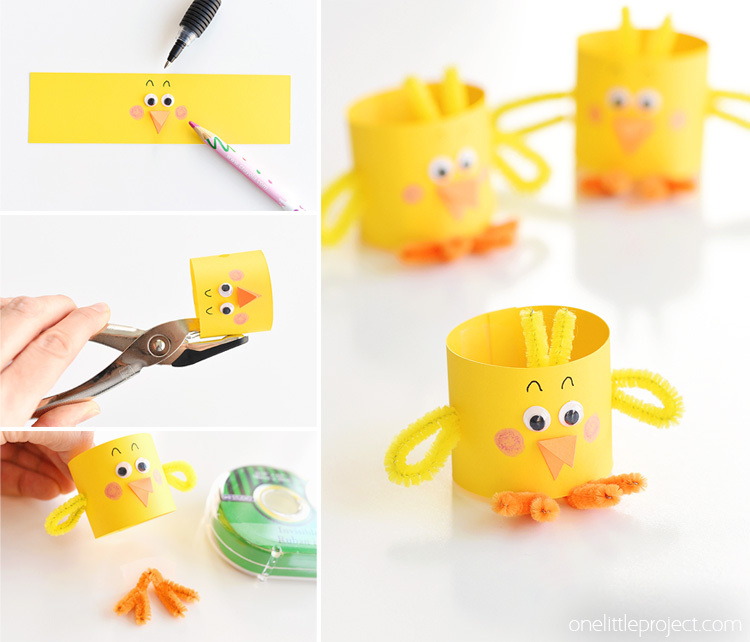 If your paper roll chicks need to be stronger, just use a little bit of hot glue to keep the feet in place. 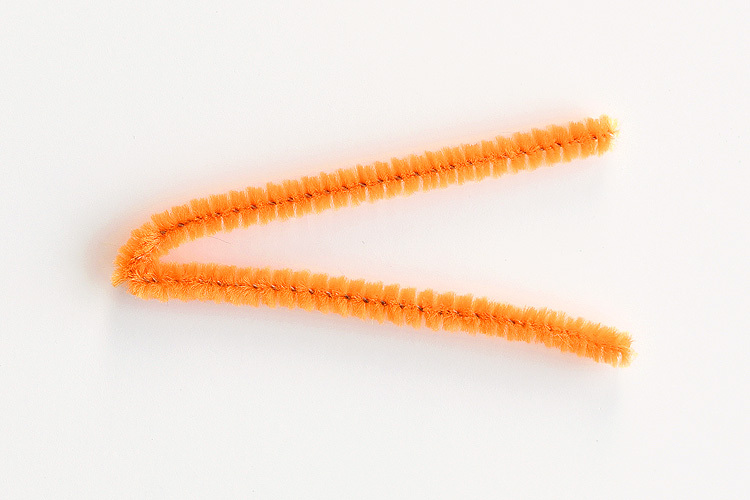 Then cut a piece of pipe cleaner, about 2.5″ long and fold it in half. 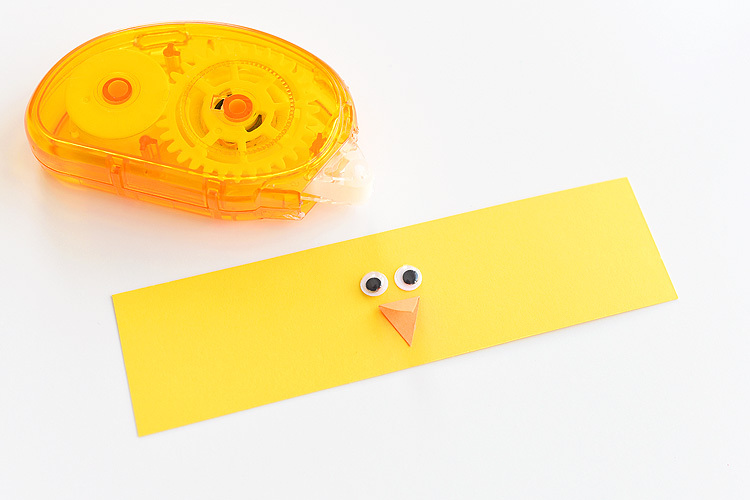 Attach it to the top of the paper roll with a piece of tape. I bent the feet slightly upwards so they would stick out from under the chick. 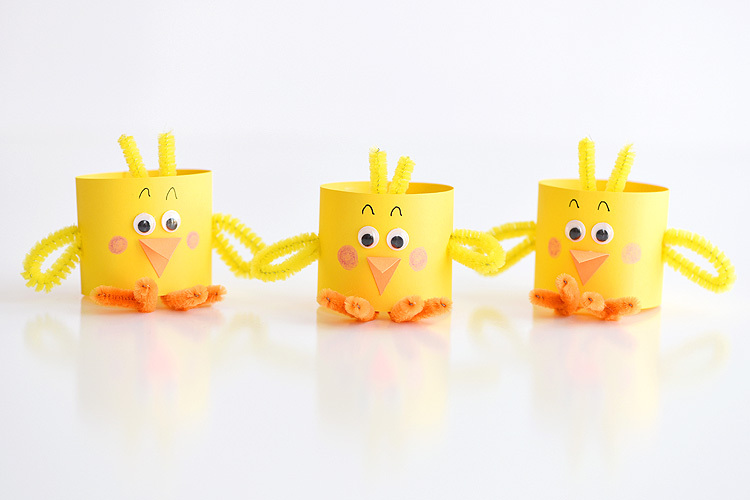 I love how bright and happy these paper roll chicks look! Can’t you just picture little eggs sitting inside of them? I wish I would have thought of taking a picture with eggs in them! 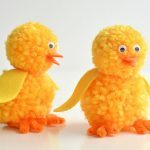 It only takes about 5 minutes to make each chick, so they are really quick to make with the kids. 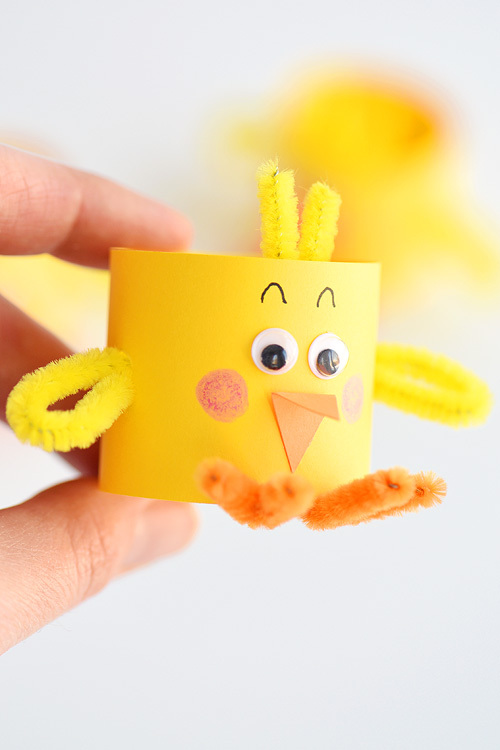 As long as you keep the face simple, it’s really easy to make a cute and happy looking chick. The only drawing skills you and your kids will need will be for the eyebrows and rosy cheeks. Easy peasy! 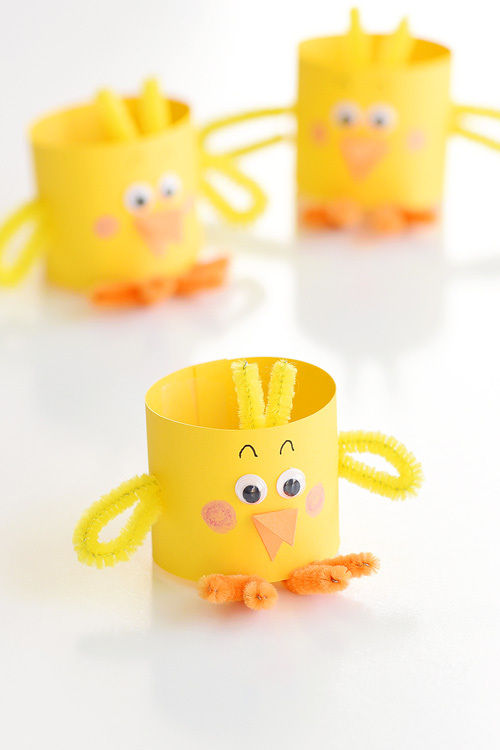 These paper roll chicks are such an adorable Easter craft idea and they are super simple to make! 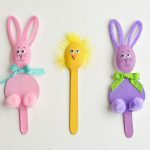 They’re an adorable decoration for the Easter table and a fun, low mess craft to make with the kids. 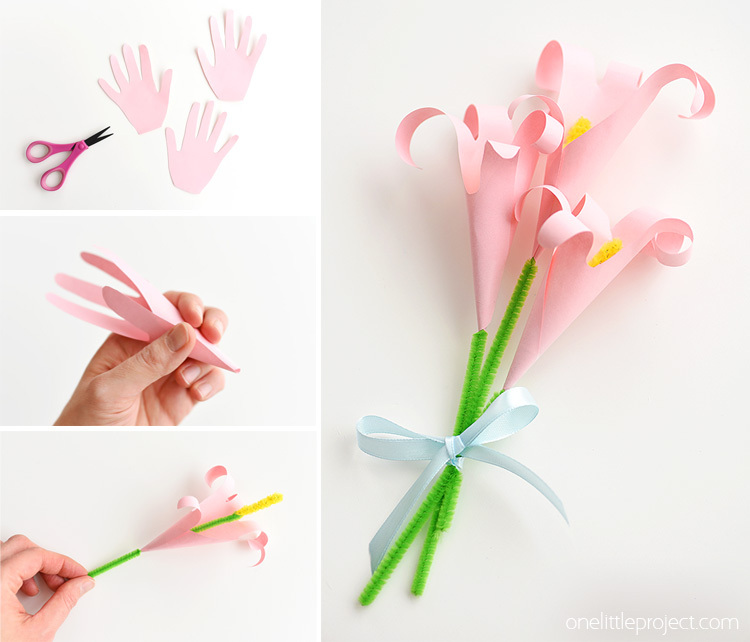 If you’re looking for more super cute Easter craft ideas, check out our tutorial for making paper handprint lilies. Who would have thought you could use handprints to make a flower? !